The CO2 fixation of module II generates 3-phosphoglycerate generated by the Calvin cycle. 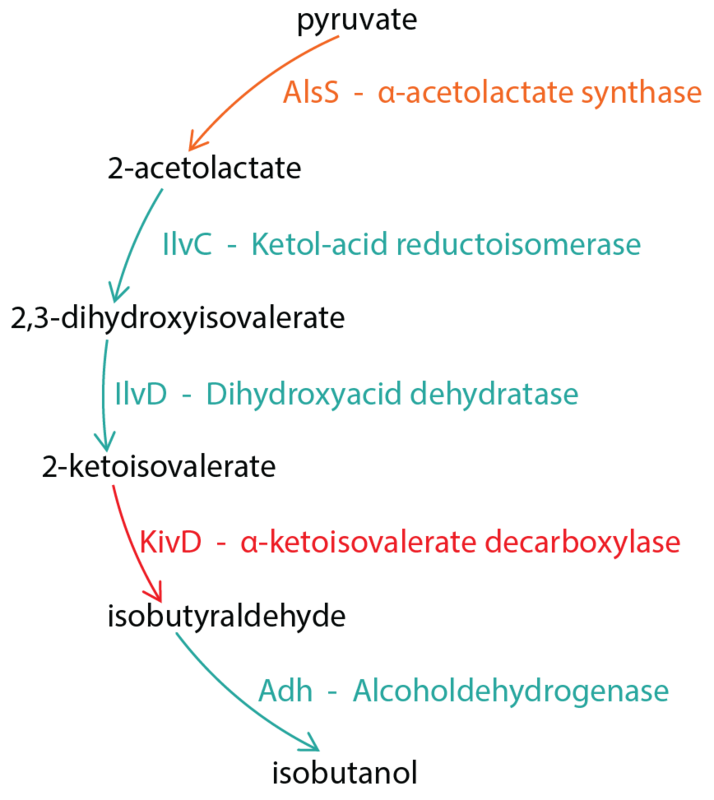 The 3-phosphoglycerate is transformed to pyruvate by glycolysis. The pyruvate is now used as the initial point for the product synthesis. Pyruvate is the starting point of the producing pathways of a variety of industrially relevant products like isobutanol, isoprene, putrescine or even antibiotics. We decided to introduce an isobutanol production pathway which starts with pyruvate (Figure 1). (Atsumi et al., 2008) This pathway is explained in more detail in the section Genetical Approach. For this we used and improved some of the BioBricks from iGEM Team NCTU Formosa 2011/2012, which were available at the parts registry. We used the gene coding sequences of four out of five required proteins for the isobutanol production. For further information about our cloning strategic, please check our Genetical Approach section. 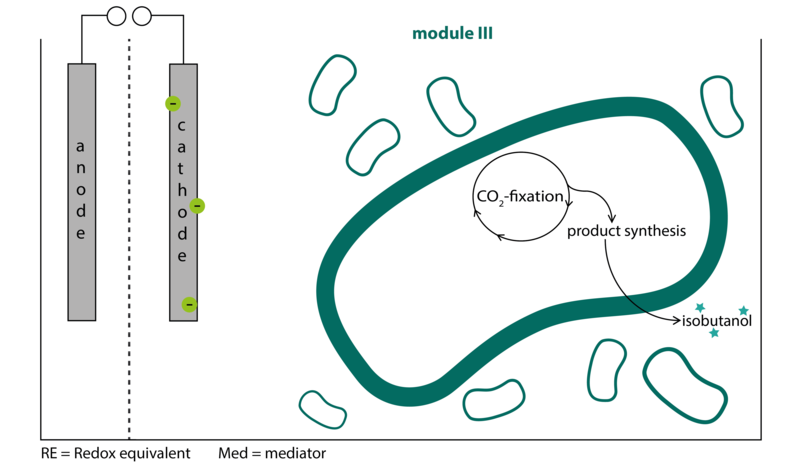 The product synthesis can be changed through the modularity of BioBricks, so that variable high value products derived from pyruvate can be implemented in the future. Isobutanol is an amino-acid-based alcohol and consequently an organic substance. Figure 3: Chemical structure of isobutanol. In the following table 1 you can find some general information about isobutanol. Isobutanol has many applications. In the following table 3 you can find a list of the span of applications and how much isobutanol is applied for the various uses in the United States. As the table shows there are three big markets for isobutanol in the United States. The largest one is the production of zinc dialkyldithiophosphates (ZDDP). ZDDP is an additive for lube oils, greases and hydraulic fluids, which work as anti-wear and corrosion inhibitors. The conversion of isobutanol to isobutyl acetate is the second largest market. Applications of isobutyl acetate are for example coating, adhesives, or cosmetic/personal care solve (DOW). The use of isobutanol as a solvent is the third largest market. It is mainly used for surface coatings and adhesives. Hence it is used as a latent solvent in surface coatings or even as a processing solvent in the production of e.g. pesticides and pharmaceuticals. (INCHEM, 2004) These tables show the importance of isobutanol for industrial use and large amounts are needed all over the world.